We'll love to have you! Not that anyone has signed up for Thursday games yet ;). But we'll get players! Of course, if you show up you'll have to play. That's just polite. Exiles is is perfectly designed to just hop right in and leave when you like. Just have some generic tickets when you show up. I'm pretty sure I'm not officially allowed to let you play unless you have generics. We'll get you sorted out. Man, I am jazzed about giving this a go! A ranchy-raunch RPG mini game? Count me in! Awesome! We'll be glad to have you! And if you're looking for a little bit of raunchy, I did an impromptu Facebook Live last night that was... a little interesting. And for those of you who can't see red, here's a giant, obvious link! Things are starting to heat up over here at Mindworm Games as we prepare for Gen Con. In fact, we have some big news that will be coming shortly. I'd post the image here, but I'm pretty sure there's some naughty words in it! As a consolation, I will introduce you to one of the special, Gen Con exclusive Bad Guys that will be murdering y'all during our Ticking Around events. We just released the first part of our two part rulebook, Learnin' the Game, for free download online. You can go here to download it. Or click this handy button! We will be releasing the other book, aptly titled The Other Book, in short order. Stay tuned! 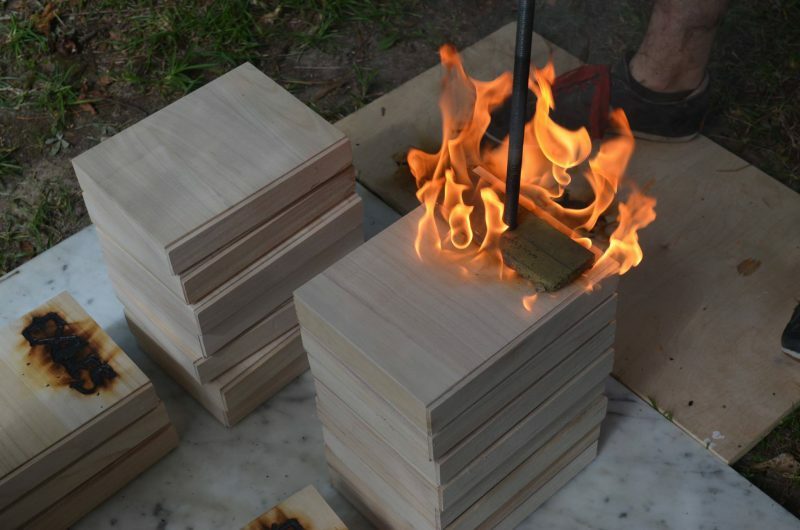 Also, we had a lot of fun yesterday burning the Exiles brand into our product boxes. Head on over to our Facebook page to see a video of that we shot live. Warning! It's not exactly safe for work. We just released our second rulebook, The Other Book, for free download. If you are playing in our Exiles events I strongly suggest checking these out! The Other Book gives you all the info you need about the types of characters you can play, what their skills are, and how you can make them more awesome as the Events progress. You ARE playing through the whole campaign, right? We are currently working our butts off getting the Exiles products ready for Gen Con, but in the next week or so we will be posting up some tantalizing previews of our exclusive Gen Con Exiles campaign, Ticking Around. We still have a few spots open, so move quick! Just so's y'all know, we are having an Exiles work day/gaming session today, and we will be doing a couple of Facebook Live sessions. The first live vid today will be while we are working in the shop, and I'll do another live feed when we start gaming. We are running a big group through our Gen Con exclusive campaign this evening, starting at about 5PM CST. So if you'd like a peek at what will be in store for you during our events, come check us out! You can watch the videos on our Facebook page, obviously. Looking forward to giving this a try. Any more news about Gencon exclusives for Exiles? Man, it has been busy in the workshop! But I am proud to say that we've managed to meet our most ambitious goals! The products look great, and our Ticking Around campaign is tight and ready to rock! You are totally right that we should have some updates for you! I'll see what else I can cook up for you, but for now let's take a look at some of the exclusive Exiles item cards you'll get as loot from the campaign. 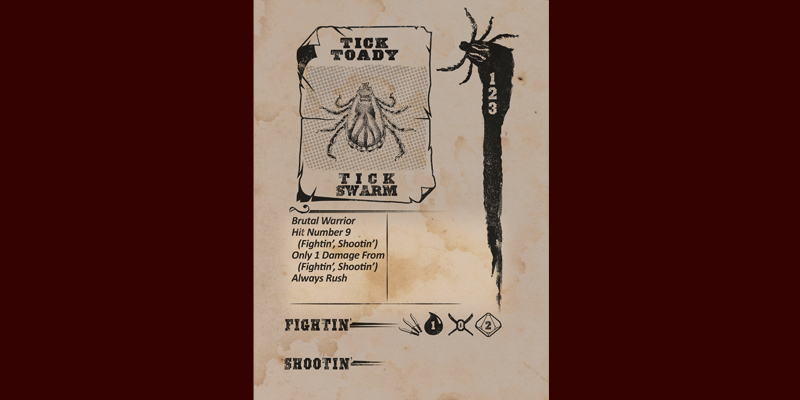 Each event players will get fun items as loot, most of which will only be printed once, just for Gen Con 2016! 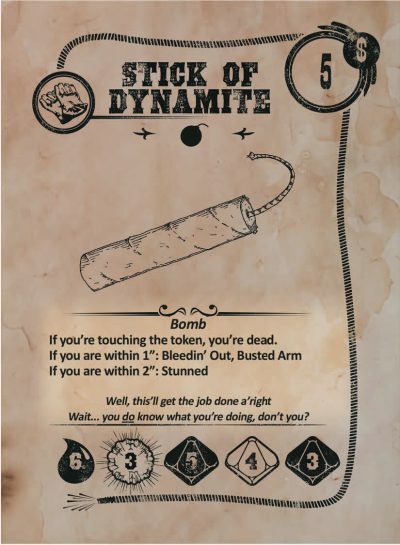 First up, players will get their hands on a Sick of Dynamite! While this isn't an exclusive card, the item makes for a heck of a lot of fun on the table. You don't want to be anywhere near when this thing explodes! 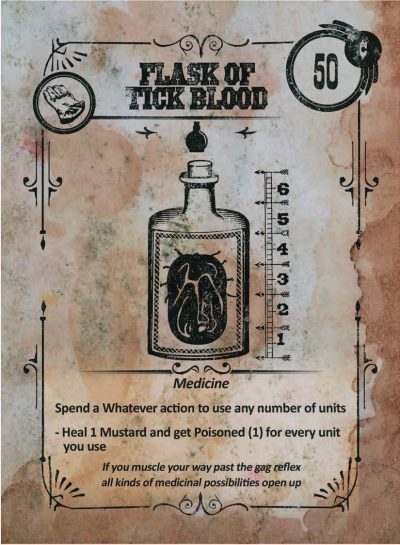 Next we have the lovely Flask of Tick Blood. Don't ask me how you'll get it! 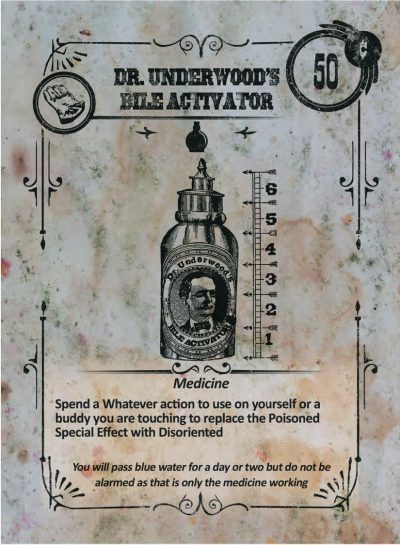 This handy item actually allows you to perform some supernatural healing, at the low, low cost of debilitating illness. And the final preview I've got for you today is one of my absolute favorites of the exclusive items! I remember when half the old ladies in the country were dope heads ;). Thanks for the kick in the pants, fpras! As is traditional, later tonight I will post up the introductory fluff for the first event of the Ticking Around campaign. As promised, you can get the introductory fluff for the first of our Ticking Around Events here. Or even this link right here. I've been out of pocket in Philly this week (for work, not the DNC), but I'm flying back, well, now actually. Now that we are basically done with our Gen Con prep, I'm going to take a walk through the workshop this afternoon and show y'all what our finished products look like! We'll also be putting final touches on the terrain we've been building for the Ticking Around events, so you'll get a chance to get an early look at what we'll be brining to the show in a few days! Make sure to keep an eye on our Facebook feed this afternoon if you want to see everything live! Weeble1000, Absolutely loved the Exiles game!!! Played the events on Sunday and gave you my card. If you could, when you get recovered from the con, shoot me an email so I can get some additional information from you.